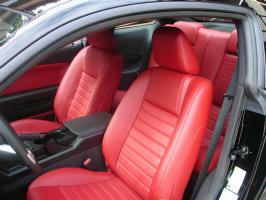 22 July 2007: New Colours announced for 2008 model year: Candy Apple Red (a 1965 colour); vapor silver, metallic silver. Four colours are dropped: Windveil Blue, Redfire, Tungsten Silver and Satin Silver. Shelbys now available in Vista Blue [thank you Ford!] Dark Highland Green is announced for the 2009 "Bullitt" special edition. May 2007: Exchange Rates rise to give us the magic $2 to one Pound. Stangs are even more affordable now, so why not treat yourself? 22 August 2006: More dreams come true. I personally rent a GT-H in Florida. See the pics here and a full write-up here soon. 13 August 2006: Waheyy! Dreams do come true! Ford and Shelby have teamed up to produce the Shelby GT. We've produced a model lineup section to the website to help sort out any confusion. 11 August 2006: Pictured! The GT-H gets a visit from yours truly in Florida. We also get insider pics on how the GT-H was produced (and how the Shelby GT will be produced). 8 April 2006: Spring is here - and despite the drought warnings (and the rain!) everyone wants a convertible. See what we have in Stock here in the UK now. 21 Feb 2006: Insurance can be difficult to get right. We've been through this and can give you our advice. 1 February 2006: Treat yourself to a convertible. Summer is around the corner, and if you order now you'll have it in time for the glorious British summer! The 'vert makes a good winter car too, well-insulated with a glass rear screen with heating element. 31 January 2006: A lot of folks have asked about finance, so we've investigated a few options for you. 19 Sept 2005: £1 per litre worrying you? Don't worry.... be happy! The '05 Stang is surprisingly fuel-efficient. 7 August 2006: 2006 Specifications are only a small departure from 2005. The big change is on the V6, offering a "standard" package (lower spec than deluxe) and a "V6 Pony" package, and some new 18" wheels now available on the V8 GT. For full details see the updated V6 specs and the updated V8 specs. 18 July 2005: 2005 Mustangs are smaller than 5-series BMW saloons! 11 July 2005: Summer's here with a vengeance and we see lots of demand for convertibles. 18 June 2005: Our stocks in the UK increase, but demand is still strong for both Coupe and Convertible. More and more 2005 Mustangs are being seen on UK roads. 16 May 2005: V8 GTs continue to demand a premium, however we have been privileged to gain access to more cars - we can now offer a Titanium Grey Auto with Black Leather. See our "in stock " section. SOLD. 24 March 2005: We hear that V8 GTs are still in high demand among dealers in the US and are commanding large premiums over list. The good news is that the lots are full of V6s, both convertible and coupe, and dealer stock means that we can negotiate discounts from the dealers. 23 March 2005: Cobra version released - more info soon. 28 Feb 2005: IUP back to full production although V8 orders are on long lead times. 22 Feb 2005: V8 GTs are in high demand, dealers are quoting long lead times and even talking of "price premiums" of up to $5,000 for cars that are immediately available. 31 Jan 2005: Ford release the convertible pricing, making an almost exact premium of $4,000 for the convertible over the coupe. Whilst this causes us to be disappointed, it does mean that we can change the orders that have been held up in our system (by Ford) for so long. We are contacting all our customers who have IUP in their order to let them know the options now available on packages. 7 Jan 2005: Confusion over "will a RHD be available?" reigns thanks to the Daily Mirror. Our information says not, but we will keep you informed. 5 Jan 2005: Information on the Interior packages is now available, as well as more details of the convertible which will be available for pre-ordering from January 10th 2005. We've revamped the options section of the website with more details on what each option looks like. At 'Stangs we understand that you can't (easily) pop round to a dealer to take a good look at the car itself, so we've added significantly to the gallery as well to show the different interior colours with various option packs. 2 Jan 2005: Happy new year to all our visitors, especially to Chris Andrews. The backlog of "interior upgrade" packages are extending our delivery times, which is disappointing. We've revamped the "in stock" page to account for this as the dates were looking unrealistic. Stangs service is all about communication and we're working on our next newsletter for all of you who have registered. The climbing dollar ($1.912 today) makes the 2005 Mustang an even better deal for our customers! 31 December 2004: We're all looking forward to the US launch of the convertible, due at the Detroit Motor show in January. 28 November 2004: We are advised by our U.S. dealer that lead times are slipping because of demand in the home market. There is good news though, the exchange rate is moving in our favour: £1.00=$1.894; that's 4 cents better off than last week, making the 2005 even more affordable in the UK. We've updated this site with new options, and lots of new pictures in the Gallery. Also more reviews have been found (thanks to those who emailed these in). 22 November 2004: Minor changes to the U.S. price lists mean that we have revised our pricing sheet. This has been emailed out to those who have asked for it, using today's exchange rate of £1.00=$1.854. We are still waiting for exact delivery dates on our "stock" cars. Make sure you register your interest with an email address so that we can get the latest information out to you. 10 November 2004: Delays in the US mean that our cars will be late. However, all of our existing orders are willing to wait those few extra weeks to get into their 2005 Ford Mustangs. 9 November 2004: We've added Car magazine's "review" articles to the website. 28 October 2004: Demand is so strong that our initial allocation is almost entirely sold out, but we can still get cars for delivery in early 2005. 18 October 2004: The 2005 Mustang is finally released, pricing is announced by Ford U.S. and the first "show cars" are now in dealerships across America. Stangs.co.uk have secured a limited quantity of cars which will be ready for customers in December 2004. We take care of all the importation, taxes, insurance and approvals. Of course the cars will be left-hand-drive. Due to pre-ordering requirements you ideal choice may not be immediately available, however we are dedicated to customer service and will do our best to ensure you are completely satisfied with your 2005 Mustang. 2 July 2004: Stangs.co.uk approach Ford dealers in the US to gain access to early cars. 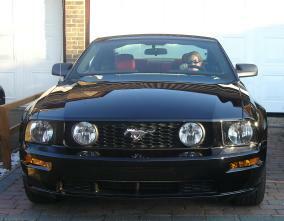 This means that stangs.co.uk will be among the first 2005 Mustangs available in the UK. 3 March 2004: Pictures in Autocar completely blow our minds here. We want one! 18 January 2004: Pictures of the "new" boss of Ford show the 2005 Mustang to be exactly what we want - but will it be in the right price range? We've seen the Ford GT(40) and that's a little too expensive for our taste (even if Jeremy Clarkson does want a Ford GT). November 2003: Early "concept" pictures look so retro, it's almost too good to be true. But will the interior match up to the exterior?